The IGLTA’s John Tanzella and Iris Serbanescu. 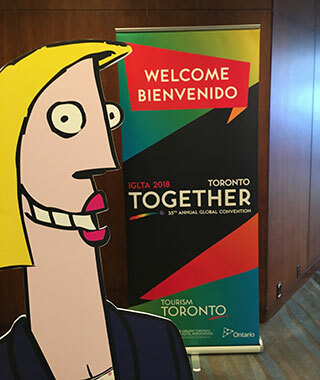 Tina the Travel Agent attends the IGLTA’s 35th Annual Global Convention. Community Marketing & Insights’ Thomas Roth and David Paisley. 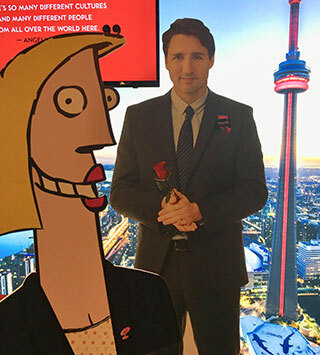 Tina was especially fond of the life-size cutout of Justin Trudeau, provided by event host, Tourism Toronto. 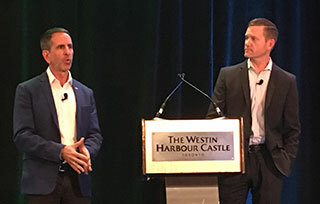 Annual Global Convention at The Westin Harbour Castle in Toronto last week, highlighting the city’s rich cultural diversity as a reason it made an ideal host. With a vision to be “the global leader advancing LGBT travel,” the IGLTA convention is the largest of its kind, with a total of 40 countries represented in Toronto. Welcomed by emcee Iris Serbanescu, the IGLTA’s co-ambassador for Canada and manager of trade development for Bannikin Travel & Tourism, and John Tanzella, president and CEO of the IGLTA, members in attendance were provided with a deep dive into LGBTQ travel trends, and specifically Canadian travel habits. Through a presentation from Community Marketing & Insights, Thomas Roth, president, and David Paisley, senior research director, took the room through their ‘LGBTQ Tourism Study on Canadian Travellers’, highlighting that the market here in Canada is estimated to be worth a staggering $4.5 billion. Comparing Canadian LGBTQ travellers to their U.S. counterparts, the survey found that overall LGBTQ Canadians tend to take slightly fewer vacations but they tend to spend more days in the destination and tend to be “year-round travellers,” making it a great market to target for shoulder season travel. In terms of what “type” of traveller they are, survey respondents were a mix, with 4% considering themselves luxury travellers, 28% “moderate, with a little luxury”, 26% moderate, 28% budget travellers “with an occasional splurge”, and 14% budget/economy travellers. In terms of time spent away on vacation, 53% of respondents spent four or more nights away, while 51% tended to go on shorter vacations of one to three nights away. 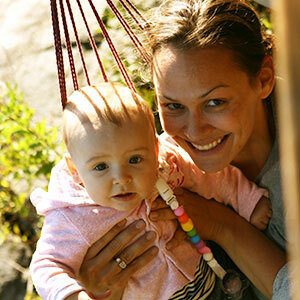 What’s more, 76% of LGBTQ parents took at least one trip with their children in the past 12 months, 45% of which went on an urban/city vacation, 40% travelled to a resort town, small town or rural destination, and 36% went on a beach vacation. Breaking it down a bit further, Puerto Vallarta ranked among the higher preferred international destinations for gay and bisexual men, while Cancun was a top choice among lesbian and bisexual women. To read the full survey by Community Marketing & Insights, click here. To learn more about the IGLTA, click here. Having worked in travel for the last 16 years, Kerry has experience covering the industry as media, as well as being under its lens when she worked for Thomas Cook, TravelBrands and itravel2000. A new mom, Kerry recently returned to the workforce and when she’s not chasing after her daughter, you’ll see her out and about covering industry events alongside her new BFF Tina the Travel Agent.